Police patrol a street in the low-income suburb of Epworth in Zimbabwe's capital Harare during violent demonstrations. THE Zimbabwe Hospital Doctors Association (ZHDA) said Thursday it had treated 68 Zimbabweans from gunshots wounds sustained during a heavy handed state reaction to three days of a national protest by angry locals over a government hike on fuel prices. According to ZHDA, a total of 172 cases were recorded at different medical centres around the country. The group said 17 individuals have since undergone emergency surgery as they had life threatening conditions. "68 cases were gunshot wounds with the affected individuals sustaining severe injuries which required urgent surgery in most cases," said ZHDA in a statement Thursday. "The remainder of the cases ranged from assaults with sharp objects, booted feet, baton sticks, sjamboks and tarmac abrasions." 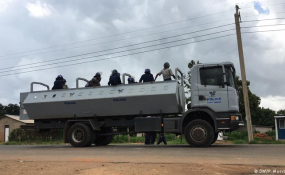 ZHDA said it was also deeply worried by cases of police dog bites on those in police custody in Kadoma adding that three such cases had been documented. The doctors group said it also witnessed with "shock and condemnation, the dragging of patients with life threatening conditions to court". "These are cases of patients who had chest trauma and fractured limbs who were forcibly taken from hospital to attend court despite the advice of doctors," said the group. Government has reported the arrest of 600 individuals linked to the violent skirmishes while the Zimbabwe Lawyers for Human Rights said it had secured the release of six juveniles in Bulawayo.